The potatoes will either become potato salad or get roasted. The broccoli and radishes eaten raw as snacks over the holiday weekend, and the chard and kale sauteed with garlic as a side. Carrots will almost certainly become baked carrot fries and the basil will be made into pesto. I, of course, swapped out the romaine, this time for dill. With two bunches of dill on my hands I'm in the same situation as I was with the rosemary two weeks ago -- strong herb, lots in stock. Time to make and to use of some non-traditional pesto. Fortunately I found an interesting recipe that uses dill pesto: Mozzarella, Tomato, & Dill Pesto Panini. 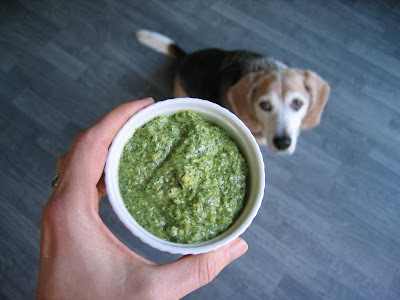 While there's a recipe for the pesto included, I plan to stick with my tried and true vegan pesto recipe from the Voluptuous Vegan included below. The dill pesto pictured here, which I just made, is fantastic. I find dill can be overpowering, but the combination with walnuts and garlic, two other strong flavors, is solid. We'll serve this alongside a crudite platter, but it would be great on pasta, tossed with roasted vegetables, etc. Herbs successfully tried using this recipe include basil, dill, and parsley - all yielded excellent pesto.